Despite a cooling market, bidding wars remain the norm in California, Boston, and D.C.
SEATTLE, Dec. 12, 2018 /PRNewswire/ -- (NASDAQ: RDFN) -- Thirty-two percent of offers written by Redfin agents on behalf of their home-buying customers faced one or more competing bids in November, down from 45 percent a year earlier, according to a new report by Redfin (www.redfin.com), the next-generation real estate brokerage. This marks an all-time low since the company began tracking data on Redfin offer competition in 2011. Even so, some zip codes in fast-cooling coastal markets are still hotbeds for bidding wars. Topping the list of zip codes where the vast majority of offers Redfin agents wrote from September through November faced competition are 94602 (Oakmore, Glenview and Lincoln Highlands) in Oakland, California, 20009 (U Street Corridor, Adams Morgan, Columbia Heights and Shaw) in Washington, D.C., and 92870 (Placentia) in Orange County, California, all with 85 percent or more of Redfin offers facing competition. Other still-competitive zip codes include 94110 (Mission District) in San Francisco, California; 20904 in Silver Spring, Maryland; 01890 (Winchester), 02476 (Arlington Heights), 02148 (Malden) and 01801 (Woburn) in Boston, Massachusetts; 95630 (Folsom) in Sacramento, California; and 95035 (Milpitas) in San Jose, California, each with 70 percent or more of Redfin offers facing competition from September through November. "There aren't many homes for sale in and around the city of Boston right now," said Redfin agent Luke Welling. "Bidding wars are still the norm in Arlington Heights, Malden, and the Somerville and Cambridge areas. Proximity to Boston and the local universities, coupled with highly rated schools in the surrounding towns make these neighborhoods sought-after destinations for many homebuyers. Buyers still need to make offers well over asking price to win a home." Seattle is one previously hot market now absent from the list above. The only Seattle zip code where more than half of Redfin offers faced competition in the last three months was 98115, which encompasses the Seattle neighborhoods of Maple Leaf, Wedgwood, and View Ridge. During the spring selling season earlier this year three out of four offers in Seattle faced competition. As of November only about one of every five offers in the Seattle area faced competition, the lowest rate of Redfin's largest markets. Philadelphia was the only metro area where buyers faced significantly more competition in November 2018 than in November 2017. Philadelphia is one of the markets where inventory is shrinking and homes are selling faster and for more money. 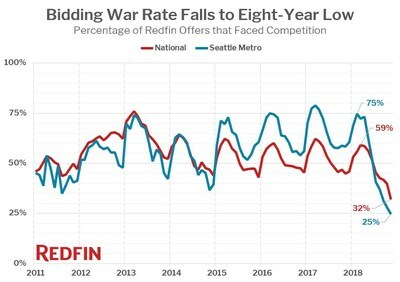 To read the full report, complete with graphs, charts, and additional metro-level data, visit: https://www.redfin.com/blog/2018/12/bidding-wars-plummet-to-an-eight-year-low.